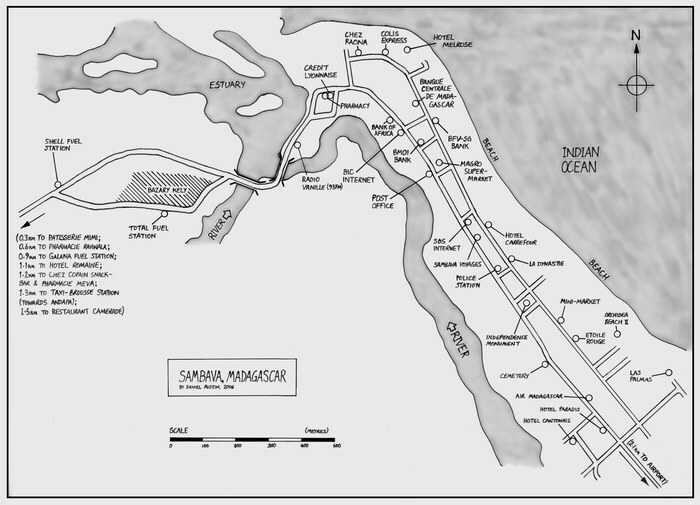 A street plan of Sambava on the northeast coast of Madagascar marking places of interest to visitors. Compiled from information gathered in Sambava by Daniel Austin in December 2005. Hotels: Las Palmas, Orchidea Beach II, Hotel Cantonais, Hotel Paradis, Hotel Carrefour, Hotel Melrose, and Chez Raona. Restaurants: �toile Rouge and La Dynastie. Shops: Mini-Market, Magro Supermarket, and Pharmacy. Internet Cafes: SBS Internet and BIC Internet. Banks: BMOI, BFV-SG, Bank of Africa, Bank Centrale de Madagascar, and Credit Lyonnaise. Other Places: Police Station, Post Office, Radio Vanille, Colis Express Shipping Agent, Air Madagascar Office, Sambava Voyages Tour Operator, Total Fuel Station, Shell Fuel Station, and Independence Monument . The distance to the following places (off the map) are also indicated: Sambava Airport, Patesserie Mimi, Ravinala Pharmacy, Galana Fuel Station, Hotel Romaine, Chez Copain Snack Bar, Meva Pharmacy, west taxi-brousse station, and Restaurant Camerade.